First solo release by this twenty string harp guitar player. New original music and creative arrangements of cover songs. Since childhood, music has always played an important part in Claude’s life. After experiencing different music instruments, Claude sets his mind on the guitar. He completes a bachelor’s degree in music at Laval University, in Quebec city, Canada, and specializes in musical composition with the renowned composer Mr François Morel. For a few years he played both the guitar and the piano. He then gave up the guitar for almost ten years but eventually came back to his first love. He has been a professional musician for 30 years. In so doing, he had the chance to perform different musical styles such as jazz, blues, gospel, folks, pop, rock and classical. Taking part in many studio recording sessions as guitarist, arranger and producer, he has been collaborating with stimulating artists thru the years. Claude recently discovered the harp-guitar. He was seduced by all the possibilities this instrument proposed. In a way, it gave him the chance to play his favorite instrument but with a larger range, close to the piano, offering him the best of both worlds and inspiring him new music. 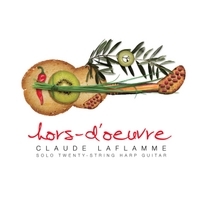 He acquired a harp-guitar custom made by Michel Pellerin, luthier and started a new musical journey. When I asked Claude why he waited for so many years before realizing a first solo album, he answered: " I waited until I had something interesting to say musically ". Sincerely, and with kindness, I suspect that my friend was waiting until he could say “everything” (without revealing too many of his secrets) in this album. Nevertheless, those who have had the chance to share his musical life for years will recognize him easily through this album. Claude expresses himself magnificently in his music, especial- ly with his guitar. Versatile and open-minded musician, he is also an accomplished pianist. But, spend a few days with him in studio and you will also discover a thoughtful and meticulous director, a creative and sensitive arranger. He is as attentive to the aesthetic qualities of a project as to the quest for the perfect sound. And moreover, he is an outstanding cook! All these qualities are combined in this album. The harp-guitar allows him to reveal the diverse facets of his talent. This underestimated instrument (which has nevertheless a century of age) possesses a very wide range comparable to a piano or a harp. When he plays it, Claude tries to express different feelings, styles, musical colours. While listening to his four compositions, tons of images rush through our heads. When he proposes the re-reading of popular music hits, we are seduced by the fineness and the beauty of the arrangements. For Claude, the heart passes before the show-off. The musicality before the flashiness. Ah, I forgot. And cooking in all this? The album is called Hors-d’oeuvre. Indulge!